Edmund SMART was born on 18 September 1831 in Moulton, Northampton and was later baptised there on 8 October 1831. Like the rest of his family, he came to New Zealand in 1850 on the Randolph. His usual occupation was either that of a labourer or of a farmer. He married his first wife Sarah Jane COX on 3 November 1853 at St Michael's Church in Christchurch. Sarah Jane COX was baptised on 8 November 1835 in Hardingstone, Northampton, England. She died on 30 January 1870 in Christchurch and was buried three days later in St Peters Church Cemetery in Christchurch. Between them, they had six children. Clara Jane SMART, born 8 August 1854, baptised 15 October 1854 and died 15 Jun 1938, all in Christchurch and is buried in the Linwood Cemetery in Christchurch. She married Isaac Henry PENTECOST on 1 January 1874 at the House of Rev C Fraser, Vicar of St Andrews Presbyterian Church in Christchurch. They had seven children. Alice Maria "Maria" SMART, born 31 October 1856 in Christchurch, baptised on 4 April 1857 at St Pauls Church in Papanui, Christchurch and died on 11 November 1939 in Feilding and is buried in the Cemetery at Feilding. She married George MILLS on 26 March 1883 in her step mothers son's house on Stanmore Road in Christchurch and they had 14 children. About two years after the death of her husband, she married Richard Charles POPE on 17 October 1910. There were no children from this marriage. Alfred SMART, born on 1 August 1858 in Christchurch and was baptised on 5 September 1858 at St Peters Church in Riccarton, Christchurch. Frances Agnes Emma "Agnes" SMART was born on 23 August 1860 in Christchurch and was baptised on 16 September 1860 at St Peters Church in Riccarton, Christchurch and died about 1946 in Christchurch. She married Charles John BEKEN on 11 March 1882. They had four children. Ernest SMART was born on 17 June 1862 in Christchurch and was baptised on 20 July 1862 at St Peters Church in Riccarton and died about 1930 in Dunedin. It is believed he did not marry or have any children. Conway Lucas SMART was born on 12 July 1864 in Christchurch and was baptised on 31 July 1864 at St Peters Church in Riccarton Christchurch. He died at the Christchurch Hospital and was buried in the St Peters Church cemetery on 22 October 1872. Edmunds second wife was Frances "Fanny" MEEK. They married on 6 August 1873 at the house of Rev C Fraser, minister of St Andrews Presbyterian Church in Christchurch. Frances was born on on 17 August 1829 in Shoreditch, London, England, and died on 20 June 1888 in Christchurch and was later buried in the Addington Cemetery on 24 June 1888. There were no children from this marriage. Frances was previously married to William Thomas PENTECOST. Between them, they had nine children. Two of them, the first being Isaac Henry PENTECOST, married Edmund's daughter, Clara Jane SMART, and the second, Frances Sophia PENTECOST, married Edmund's brother Enon. 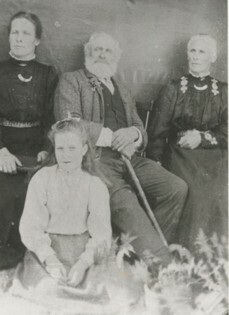 Edmund married his third wife, Jane Susannah WALKER on 24 April 1899 at the Wesleyan Methodist Church in Christchurch. Jane was born about 1843 and died on 16 November 1918. She was previously married to a Mr UREN.